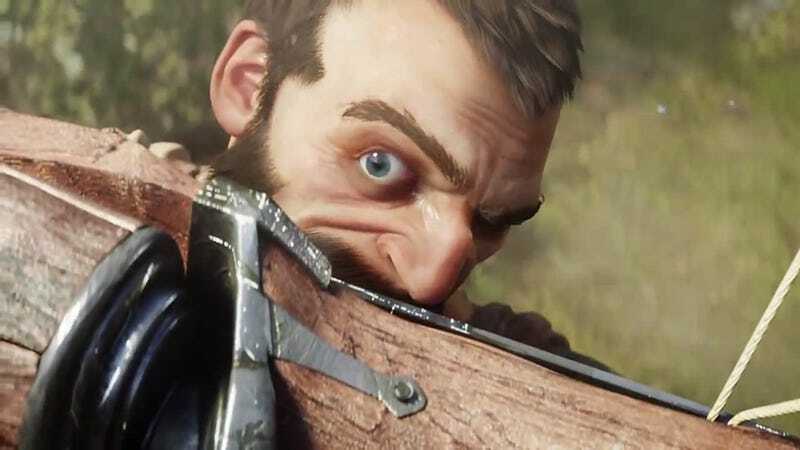 "This is the next big Fable game that is going to be out for five to ten years so it needs to be big, it needs to be interesting. There needs to be a lot of stuff to do, it needs to integrate all the cloud and Xbox One features so we keep our community alive and growing. So yeah, it's big and ambitious, but it needs to be because it's going to be around a long time." Did you catch that? Once a game is released, it's technically out forever unless it has a required online component. Legends' "five to ten year" time-frame for a cloud-integrated, community-supported endeavor sounds like a world apart from the traditionally static Albion of Fables past. The online play that Lionhead has alluded to could be as routine as adventures in patch downloads, but that doesn't seem to fit with Needham's claim that the team "[loves] games like Dark Souls with these really unique online modes and we really want to play with that in Fable Legends and the other games we're going to make here." That said, current plans for Legends will give players three AI companions to quest with, which would be atypical for an MMO. But really, Peter Molyneux's vision for the Fable series always has been an MMO, despite his misgivings about Legends' canine omission. What better way to garner genuine, human reaction from townspeople than to make them other players? What game world is more emotionally convicting than the one discovered with friends? And the option to play as a hero or a villain certainly smacks of other popular MMO staples. So far, Lionhead is just admitting to "online features" without committing to anything more, which is smart. But outside of a decidedly less ambitious plan (online co-op), all signs look to be pointing towards an interactive online community not dissimilar to modern MMO conventions. Let's just hope Lionhead keeps Legends out of subscription country.